Cast: Kevin Spacey, Kate Bosworth, John Goodman, Bob Hoskins, Brenda Blethyn, Greta Scacchi, Caroline Aaron. Directed by Kevin Spacey. Story: Bobby Darin's life story. 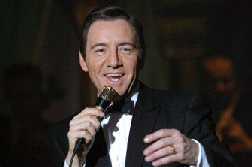 Directed, produced, written by and starring Kevin Spacey, Beyond the Sea is the story of Bobby Darin's life. At least, we think it is. Bizarrely there is a disclaimer just before the end credits that says the movie is not a literal portrayal of the man's life and some of it is fictitious ... riiiight. So the question has to be asked - if the story was spruced up to make the movie more interesting, wouldn't it have been better to start with someone better known and who had at least a semi-interesting life? Even with the made-up bits, Darin's life as represented seems pretty unremarkable compared to most stars of biopics. Beyond the Sea captures the latter half of Darin's life, from his early twenties to his premature death at 36 of the rheumatic fever that had plagued him since childhood. Clearly, Kevin Spacey is much older than that (45 at the time of filming), so this is a problem. The movie attempts to handle this anomaly by framing the show as Bobby Darin making a film about his own life, explaining to the child actor hired to play young Darin (William Ullrich) how the film is going to look, thus causing Darin to reflect on his past experiences. Thus we see the current-aged Darin throughout the 15-year span of the film. At least I think that's what they were getting at, but it was not nearly as clear as it could have been - my brow furrowed on more than one occasion while I tried to work out what on earth I was supposed to be seeing. The child actor hired to play Darin also cropped up as young Darin in his own memories, which confused me further. Are we supposed to believe that the child actor happened to look EXACTLY as Darin did in his youth, or are we supposed to infer that Darin himself is confused about his own life? On several occasions it is pointed out that events aren't depicted correctly in one's memories (maybe to justify the inaccuracies in the story? ), so perhaps this was the point - but for me, all it succeeded in creating was a confused, incongruous mess. Kevin Spacey is undoubtedly a very talented man. I've enjoyed his performances so far without exception, but looking back on them now, they are all minimalist, subdued, dry characters. From The Usual Suspects and Se7en to LA Confidential and American Beauty, through Pay it Forward and K-Pax to The Shipping News and The Life of David Gale, all his characters have the same Spacey signature. These past performances made it difficult for me to accept him as a gregarious, arrogant superstar and thus he never became Bobby Darin on screen - he was always an actor pretending to be someone else. That's not to say he was doing an impersonation - far from it. Spacey's chosen singing style is closer to Sinatra than Darin, however this somehow improves the musical numbers. Speaking of which, the songs are far and away the stars of the show. Darin's courtship and marriage to Sandra Dee (Kate Bosworth), Sandra's over-protective mother (Greta Scacchi, looking a little second-hand), Darin's family team (John Goodman, Bob Hoskins) all fade into insignificance aside the stage performances of the headline man. Only Brenda Blethyn, as Darin's mother, is memorable, though she and Bob Hoskins both suffer from having to do American accents. Knowing them as English as we do, it sounds intrusively false when they try to be Americans. Beyond the Sea is a tricky one to recommend. My companions at the cinema enjoyed it far more than I did, which I would not have predicted beforehand. The singing routines were indeed rather entertaining - I've been humming Beyond the Sea all day - but the dance sequences seemed totally out of context and were more disruptive than endearing. Despite having explained it away, the age issue is still relevant, as I was reminded of the middle-aged-man-seduces-teenager scenes from American Beauty whenever Darin and Sandra Dee were snogging - that can't be good. On the whole if I had to point a finger, I would blame the editing, as the darting from one event to another without lingering and the whole confusion over the film-within-a-film could all have been fixed with better editing and some extra shooting. Maybe I would enjoy it more a second time, but it's not going to get that chance because I was, I have to admit, rather bored at times. I will, however, be listening to the soundtrack again. Whaddaya know, the spirit of Bobby Darin's music lives on after all. Testosterone Satisfaction Rating: 0/5 Could be shown on Saturday evening TV and they'd just have to bleep the bad words. To enjoy this film you should: During the story bits, hum the last song to yourself until the next one starts.